Historical mines within the area. 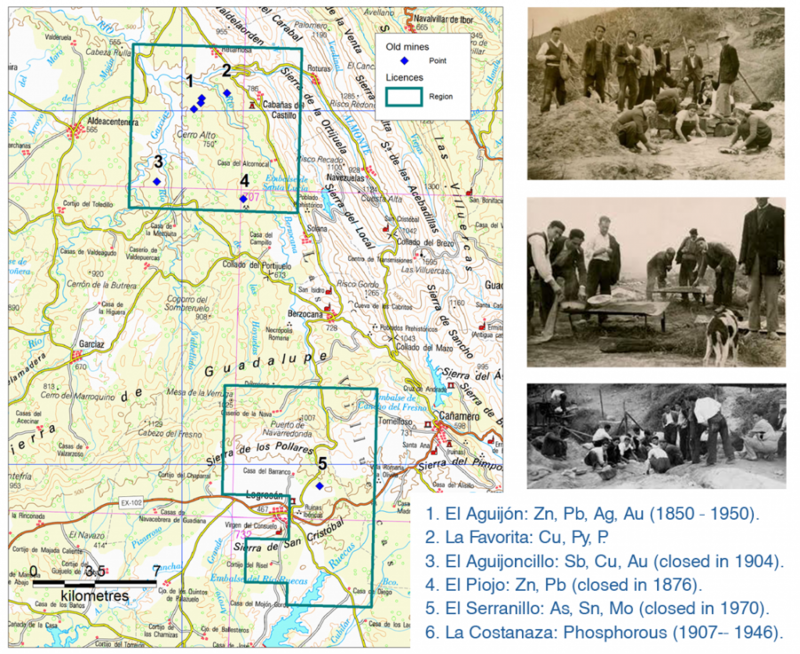 Extremadura region and particularly the selected license area has a long and extensive gold mining history. The origin of gold mining in the region can be traced back to the Bronze Age, with the presence of gold placer deposits in the NW of Cáceres province. The Roman period became the prominent period of gold exploration within the area, where extensive ore mining is strongly associated with gold-bearing veins. After the collapse of the Roman Empire, the region was strongly contested by differing factions, both political and civilian, in order regain control of this rich mining region. Such conflicts had an adverse effect on the region with regards to mining, slowing down and decreasing productivity. Following the unification of Spain, the mining industry in the region rapidly contracted and eventually ceased to exist due to the ability to import large tonnages of gold from the conquered South America. In nineteen sixties and early eighties, due to the boom in gold prices, exploration and investigation of the gold deposits has recommenced.